괘불탱이란 사찰에서 큰 법회나 의식을 행하기 위해 법당 앞뜰에 걸어놓고 예배를 드리는 대형 불교그림을 말한다. 축서사에 있는 이 괘불탱은 모시바탕에 채색을 사용하여 그린 그림으로, 정면을 향한 입불상을 화면에 가득 차도록 그린 다음 광배 주위로 화불과 보살상을 배치한 독존도형식이다. 원래는 보광전에 걸어두고 예배용으로 사용하였다고 하나 지금은 대웅전에 보관 중이다. 주불은 얼굴 형태가 원만하고 사용된 색채 또한 선명하고 화려하여 전반적으로 밝고 명랑한 분위기가 느껴진다. 한편 괘불탱에 걸려 있던 복장주머니에서 후령통(1구)을 비롯하여 사리(2과)와 씨앗류, 다라니(4종 4매), 괘불원문(1매) 등이 발견되었다. 그림의 아래쪽 부분에 있는 기록과 조성내용을 밝혀주는 ‘괘불원문(掛佛願文)’에 의하면, 이 괘불탱은 조선 영조 44년(1768)에 정일(定一)스님 등 10명이 참여하여 조성된 것임을 알 수 있다. 축서사 괘불탱화는 보존상태가 매우 양호한 편이며, 인물과 문양의 세련된 표현 및 화려하면서도 조화로운 색채의 사용 등이 돋보이는 뛰어난 작품으로 평가된다. 그리고 복장주머니에서 사리를 비롯한 복장품과 함께 다른 불화에서는 쉽게 찾아볼 수 없는 ‘괘불원문’이 발견되어 학술적으로도 자료 가치가 높다. 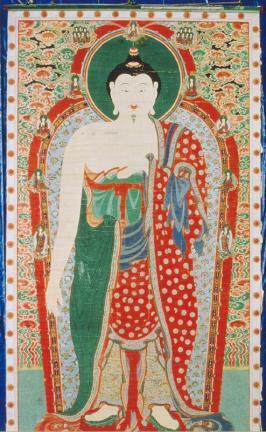 This type of large-sized painting used to be hung in the front courtyard of a temple hall at an open-air sermon session or ritual. 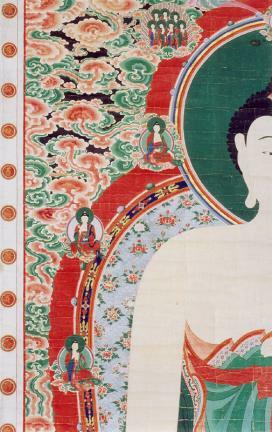 This is a colored painting made on ramie fabric background, portraying a standing Buddha in full canvas with images of metamorphosed Buddha and bodhisattvas placed around the mandorla. At present, it is kept at the Main Hall. 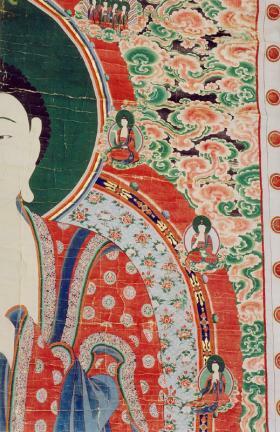 The round face of Buddha is portrayed in clear-cut, gorgeous colors, thereby creating a pleasant atmosphere. 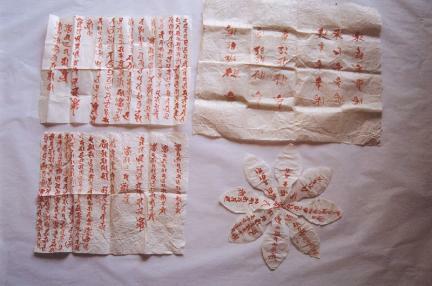 The pouch attached to the hanging painting produced huryeongtong (container containing gems, grains, incense, medicinal herbs, etc., attached to a Buddha image or painting), grains, and Dharani Sutra pages (4 sheets in 4 types) as well as two sarira pieces and a written prayer related to the hanging painting. 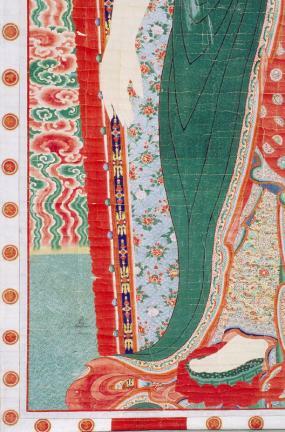 The remarks written at the bottom of the painting say that this hanging painting was made by ten monk painters, including Jeongil, in 1768 (the 44th year of King Yeongjo’s reign). This piece has been preserved very well. 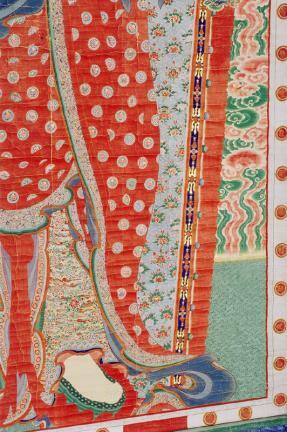 Experts say that this is an excellent piece of work with conspicuous expression of the figure and patterns and use of gorgeous and harmonious colors. 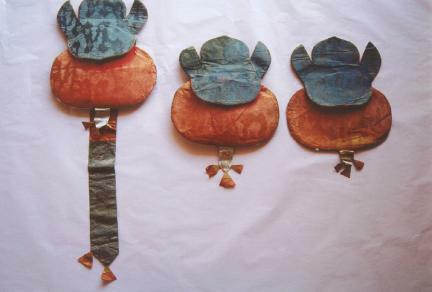 The objects found in the pouch attached to the piece and the written prayer related to the hanging painting make it a particularly precious material.